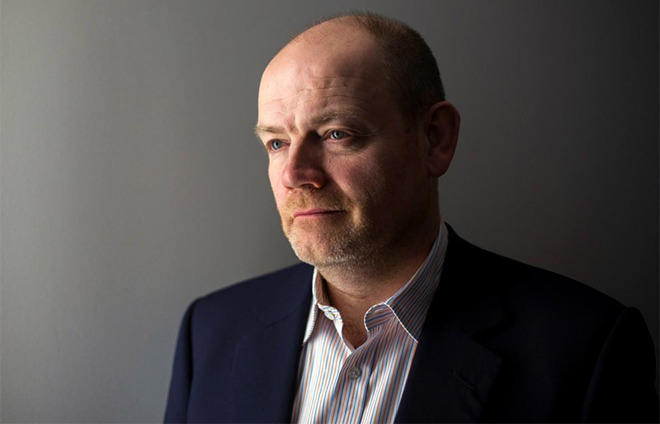 New York Times CEO Mark Thompson in an interview on Thursday offered a pessimistic take on Apple's news subscription service, saying publishers should not rely too heavily on third-party services for digital distribution. When asked by Reuters whether The New York Times planned to partner with Apple on the tech giant's forthcoming news service, Thompson deflected. "We tend to be quite leery about the idea of almost habituating people to find our journalism somewhere else," he said. "We're also generically worried about our journalism being scrambled in a kind of Magimix (blender) with everyone else's journalism." He went on to liken a potential deal with Apple to agreements film and television production companies struck with Netflix when the one-time DVD rental company forged the beginnings of what would become a massive digital streaming market. "If I was an American broadcast network, I would have thought twice about giving all of my library to Netflix," Thompson said. "Even if Netflix offered you quite a lot of money. [ ... ] Does it really make sense to help Netflix build a gigantic base of subscribers to the point where they could actually spend $9 billion a year making their own content and will pay me less and less for my library?" Hollywood was eager to take Netflix's money, perhaps without fully understanding the ramifications of its actions. Building on a base of licensed third-party content, Netflix was able to build a substantial audience and produce its own catalog of original shows that now competes with those very same offerings. While Thompson did not explicitly comment on talks with Apple, the general tone of today's published interview suggests The Times will not be part of a for-pay service expected for unveiling next week. The CEO said his publication has no plans to distribute content through third-party platforms, and will instead focus on bolstering its in-house digital subscription brand. Still, the Gray Lady is not above tapping younger demographics through experimental projects involving products like Snapchat. Apple is widely expected to reveal a news subscription service alongside a video streaming product at a special event on March 25. Though the tech giant is leveraging its massive installed user base as an incentive to join the new news initiative, publishers are reluctant to hand over control of content on what is said to be onerous terms. Previous reports claim Apple is demanding a 50 percent cut of revenue on an anticipated subscription rate of $10 per month. By comparison, The Times charges $15 a month for access to its own platform. While many major publishers are undecided about inclusion, or have declined outright, Apple has reportedly landed The Wall Street Journal in what is viewed as a major coup for the as-yet-unannounced service. AppleInsider will be on the scene in Cupertino with live coverage of Apple's March 25 press event starting at 10 a.m. Pacific, 1 p.m. Eastern. Crap "journalism" rag whines about evening the playing field. The Washington Post will bury you, old grey lady, now OP-ED propaganda for Wall Street Billionaires. You gotta love a post that’s equal part tin foil hat paranoid & juvenile rant all rolled up into one. Not many people are willing to shell out money to see a 20 year old news article. So I think he's mistaken comparing movies to news. The life cycle of a movie is probably measured in decades, while news is probably measured in weeks. He can do what he wants, but I think it would be wise to open up his newspaper to an additional 100 million paying subscribers. It is as it was with music and that industry when CDs began their decline. The dinosaurs refused to change and piracy took hold. When Apple provided a solution with ITunes some balked at the price. The came running. The same with phones, AT&T was the only carrier interested in signing on. The others tried to fight it, but was forced to come on board. Don’t worry...He’ll be back! I actually subscribe to NYT (as well as WSJ and more than a dozen other magazines/periodicals). I think having a selection of news in a centralized location is going to be increasingly important. Those that can not or will not see the value in that will loose market share and eventually become irrelevant. News is not anything like entertainment (movies, TV or music) and given the vast scope of news (everything from technical periodicals to editorial political comments) it will be increasingly important to have a central hub to then get the key information needed and then drill down on that information. The drilling down part is now kludgy as it is done through follow up Google searches. The future news should be summarized with ever deeper links to drill down on the facts behind the news, and the reports/data behind the periodicals. I still personally much prefer Flipboard over Apple's news aggregator but all of this is in its infancy. So telling the CEO of the NYT would use the name of a French food processor for his metaphor... instead of just saying “blender.” What a twit. (Relatively Loyal) NYT Subscriber here as well and couldn't agree with you more. Will be interesting to watch all this shake out over time. It would be nice to pay the paywall for access to the top ten or so publications. But that's expensive and one probably doesn't want all the local news that comes with many of those outlets. I think most people, certainly myself, would like to pay a reasonable monthly sum for access to the articles they think are important. People that want to read the NYT, daily, will subscribe to it anyway. Those that want to read a few articles a week, won't. Apple could just buy AP, Reuters or even the NYT. Or all of them! I haven't seen the details of what Apple is offering, but supplying Apple news with some reasonable amount of content for a price doesn't seem foolhardy, more like a no brainer. It's pretty funny to read a CEO (or a journalist) from an old newspaper talking about a subject like innovation or technology. Those kind of guys tend to be like dinosaure or conservative in the way they look at things, future. When we know that the journalism industry is so fragile, turning back on Apple is ridiculous. But they have great principles, they probably preferred to close rather than to be logical. Does he think that once he offers his content on a 3rd party platform, it can't be offered anywhere else? I don't understand the logic behind this thinking. You pay for the content once - during production. I would think the more places that content is available, the more revenue you stand to make. How is it any different then making your magazines available in newsstands, books stores, grocery stores, etc? Apple News is just a single point of distribution... And hopefully subscription; I really hope Apple is building a news distribution model that follows the music streaming service model... Where we pay Apple the subscription and have access to a ton of content (articles), and Apple pays the content companies royalties based on what the user consumes. My understanding of Hollywood and Netflix is that Netflix only began producing its own content because the studios wouldn’t license their movies for streaming for a reasonable amount, since they were upset at all the profit Netflix makes renting DVDs (which doesn’t require licensing agreements). Had Hollywood played ball Netflix wouldn’t have had to source its own content. Ugh...the New York Times. They lost their credibility when they tucked tail when bush jr stole the election. Another example of shoddy journalism. So original. Ok, by what measure? Well, to his credit, he didn't like Apple's terms so he decided not to put his hat in the ring. I'm looking forward to the 25th. I'm mostly interested in the roll-out worldwide. We are yet to get the TV app and the News app here, so this may be limited to the First World only. I get the point he's making, but you could also argue that under his logic, supermarkets shouldn't exist because farmers should be concerned that customers only get their good directly from the farmer. Netflix's move to original program is a) not saving them any money -- quite the opposite in fact and b) not lessening their appetite for other people's shows. Most of what Netflix and Amazon (and soon, Apple) have bought are projects they thought were very good that the traditional outlets turned down. Currently the Times is on Apple News and they do gain apparently enough subscribers from that option to keep themselves there, so I think his point is a bit undermined ... and I'm not sure he really meant what he said inferring that you (anyone) should only get your news from one source (as if that isn't precisely the big problem with American journalism these days), If he did mean it, I think he'll be disappointed, to put it mildly. For the record I'm not sure whether I'll go for a subscription from Apple New Magazines (or whatever they call it) when it happens; I'm happy to support what I think is good quality journalism (across a very broad spectrum of views and subjects), so I'll have to see what the deal entails before making a decision. But I do shop at a supermarket, so getting a wider variety of news for a bundle price seems like an attractive idea to me, if the goods are top quality and price isn't too high. I think it's a little more complicated. Google and Facebook have worked with publishers and promised they'd drive more subscriptions, or ad revenue and those never really panned out. In addition the publishers lost some control over when and how their articles were published and how they looked. Having your articles posted next to the latest anti-vaxxer FUD or whatever may not be the platforms they are so interested in being involved in. Readers start depending on Facebook and Google for news and the publisher takes a lesser role. Google in particular has a history of then taking over the position and pushing competitors out. I can understand them being cautious. I think a lot will depend on how much money Apple's new service distributes, how much control they have in their articles. If they can add ads and who else is present on the platform. Also, if Apple and the Publishers can find the right balance of sharing information about their readers. I can see a lot of companies holding back for a while. Apple's made a number of different pushes into this area and I think they've gotten a little better each time. Hopefully this will be one were they can find win situation for publishers, readers and Apple. I hope they will make the right decision, whatever that turns out to be. Leaving political orientation aside, the NYT is one of the last bastions of quality editorial journalism. Most „journalism“ today is bait&click make money one-liners, which might feed our ADHS, our need for distraction, give us reasons to be outraged and discriminate, but does nothing to help us grow as a society or people. So before you call institutions like the NYT “crap” - take a breath and (try to) think for a moment. I think he makes some good points, both in terms of the identity of NYT and in terms of original news / television content sources eventually becoming a nondescript (identifiable) supplier of content for Netflix or potentially Apple News. If 10 years down the road we only speak if Apple News and have no idea where the content actually originated from, would that be a good long term partnership for NYT et all (assuming they actually have a long term alternative option)?